Last month I was lucky enough to go to the Just So Festival in Cheshire. We arrived mid-afternoon and pitched our tent (with hardly any arguments considering it was the first time we’d used this tent and Tweetie Junior was doing his best to help us), then set off to explore. One of the first things I noticed was that lots of otherwise ordinary people seemed to be wearing – well – tails. Thick coppery brushes that looked a lot like the ones foxes have. When I looked more closely, I could see some of the people had orangey-brown pointed ears too. Now that I was paying attention, I spotted some variation among the outfits – there were feathery masks and green legs and antlers. I saw a set of feathery wings and a sequined fish tail – to be honest, I was mystified. Until I reached an area called the Village Green and saw the Tribal Scoreboard. when all became clear. The people around me were declaring their tribes – Foxes, Stags, Fish, Frogs, Owls and Lions. It was a competition. Each tribal member had to take part in special activities and quests to win rewards throughout the weekend. The tribe with the most points at the end of the weekend would be crowned as the winners until the following year. Last year, the Foxes had won and the year before that it had been the Owls. Each tribe had their own chant too, which was performed on the stage several times over the weekend. I didn’t know which tribe to belong to. I liked Foxes – they were cunning and sly and they were clearly strong contenders. But I Iiked Stags and Lions too (I’ll be honest here and say Frogs were never in the running and I’m not really a Fish person) and Owls are among my favourites – I have a knitted owl watching me type this right now, in fact. So I began to ask the children who came to my events which tribe they belonged to and why. I asked them which tribe they thought I would into and they told me, although I suspect some were a bit biased towards their own choices. 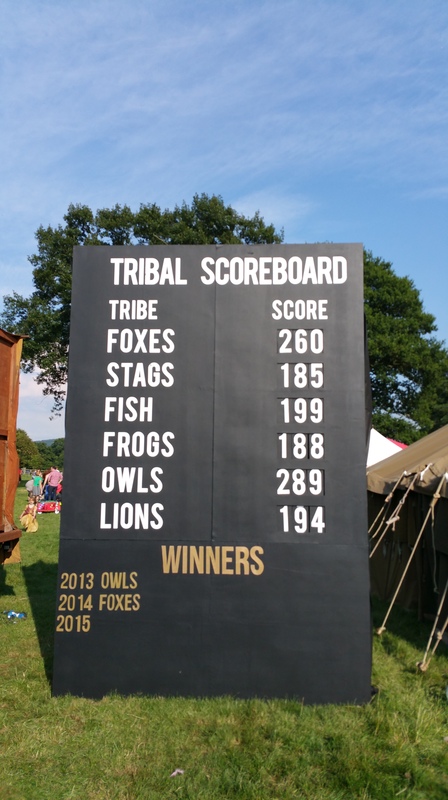 It came down to the Foxes and Owls but by the end of the weekend, I’d chosen my tribe: I was an Owl – gliding through the night on soft wings. Sadly, we had to leave before the crowning ceremony, so I can only hope the Owls were triumphant. I’m hoping to go again next year – I’ll be better prepared then, with wings of my own and a feathery owl mask, ready to battle with my fellow birds for the honour of our tribe. Which tribe would you have chosen to join and why? Tags: a writer's life, Tamsyn Murray. Bookmark the permalink.